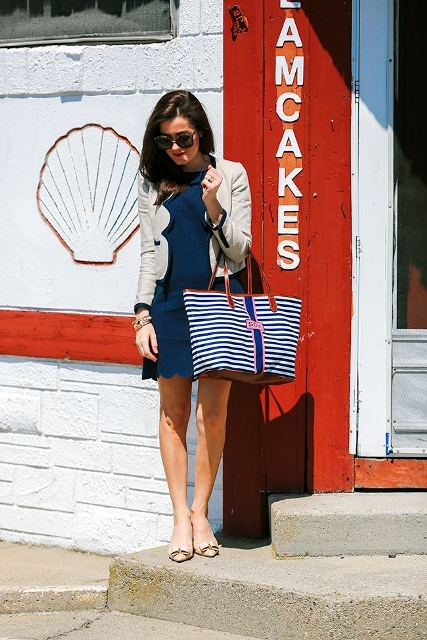 We’ve already told you about scalloped shorts, blouses and skirts, but what about blazers? 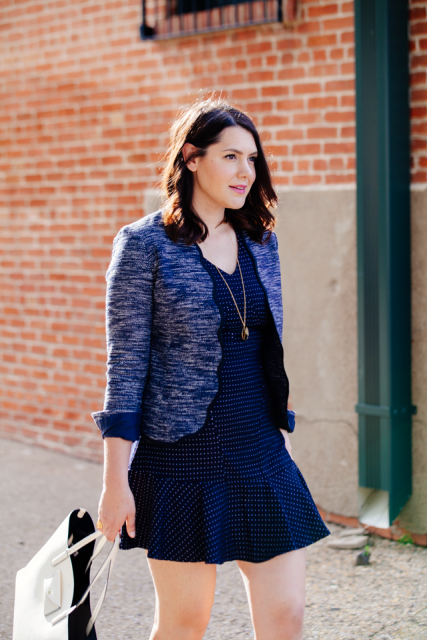 In my opinion, for spring days a blazer is a must-have piece of clothes, so you should get one. So today let’s talk about scallop blazers that look fresh and unique. 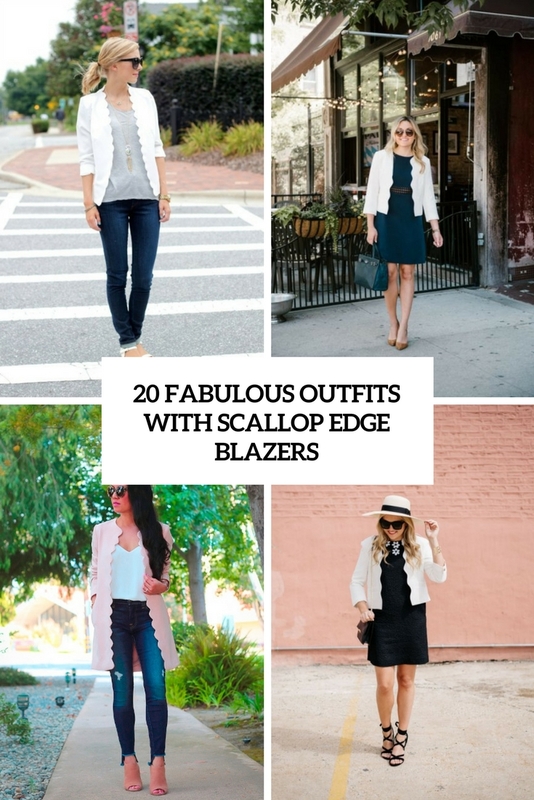 There are so many various ones, so you can choose any types of blazers with a scalloped hem from a fitted to loose, a long to crop one. And, of course, don’t forget about colors: for casual and feminine outfits you can pick up pastel colored blazers, and for elegant or more official looks pay your attention to navy blue, emerald or black ones. Scroll down to consider all ideas. For creating an everyday look you can mix a simple gray t-shirt, cuffed straight jeans, white flat sandals and a white scallop blazer. Or you can pair a white top with a crop distressed jeans, a black leather belt, a mint crop blazer, a white clutch and pale pink pumps. If you want some original ideas, then combine a white wide leg jumpsuit with a light blue blazer and white and black lace up flat shoes. For warmer days choose shorts, for example, you can make a cocktail party outfit just mixing a metallic top with a pale pink scallop blazer, pale pink scallop high-waisted shorts and high heels. 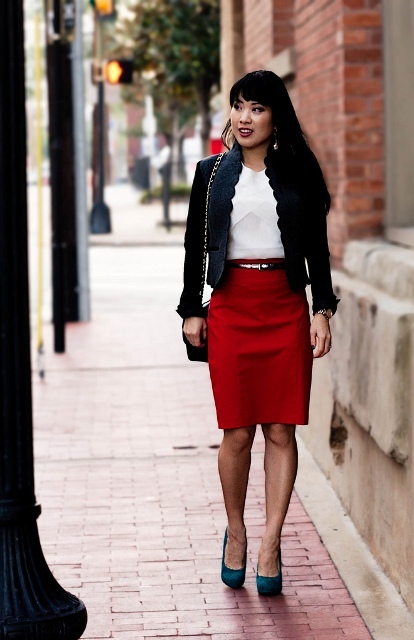 If you’re looking for outfit ideas for an office, then repeat a look with a white shirt, a red pencil knee-length skirt, a belt, a black crop scallop blazer, a chain strap bag and pumps. Or you can combine an emerald dress with a white blazer, beige pumps and an emerald leather bag. For casual outfits you can choose a white top and mix it with a brown suede blazer, a white and black checked wrap skirt and a printed small bag.